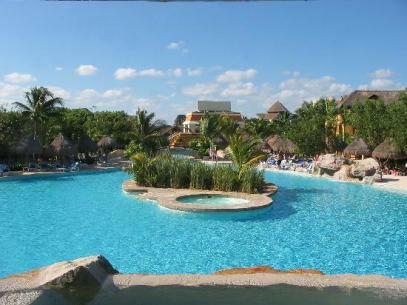 Iberostar Paraiso Lindo is a family all inclusive resort with amenities that are unbelievable! This all inclusive resort for great family vacations is in Playa del Carmen. This 4 star all inclusive resort has gorgous courtyards, cobblestone walkways and breathtaking oceanviews. This all inclusive family hotel opened in 2003. This resort has a rustic theme and you will pleased to see peacocks and iguanas on the lush grounds. With your wristband you will have access to the other Iberostar Hotels. Paraiso Maya is on the same property, and Paraiso del mar and beach are nearby. You don't have access to the Grand Hotel Paraiso next door that is adult only but you can schedule a tour to see it! The Pariso beach at this resort is just beautiful!! 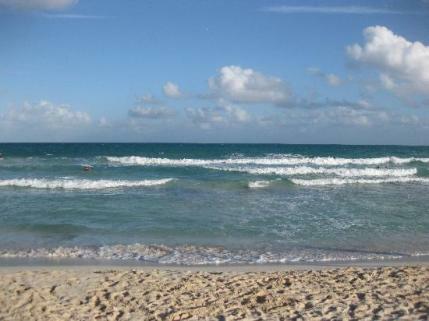 This is one of my favorite beaches in the Riviera Maya. Plush, white sands and the beach is wide. You can walk for miles in either direction of this resort. This picture is of the pool at this resort. What is unique about the Iberostar Paraiso Lindo? You can use other Iberostar resorts for free! 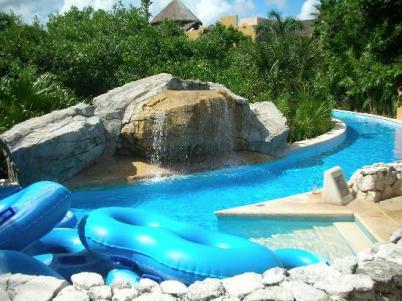 There are 5 pools at this resort which are also shared with guests from Paraiso Maya. There is a lazy river with tubes that you can float down, and also a wave pool if you need a little more action! Here is a picture of the lazy river. salon, golf course, Underground for adolescents. There is nightly entertainment with different shows that is available for free. For kids, this all inclusive resort has Lucy's Club. Kids can read, color, watch movies and do all kinds of activities. And of course everyone's favorite hanging out at the pool and beach! Iberostar Paraiso all inclusive has 4 dining areas. If you include dining areas at Paraiso Maya which is on the same property then you have 11 to choose from. They include: Cajun, Italian, Chinese, Japanese, Mexican, Steakhouse, International buffet, grill snack bar and ice cream parlor. At this all inclusive Riviera Maya family resort they have 24 hour room service. Check out the beautiful walkways you will see as you walk to your favorite restaurants! Ironing board, safety box, mini bar and hair dryer. Each building has it's own concierge! For families with kids you can get rooms that adjoin!